Diamond Z horizontals are designed for processing brush, yard waste, clearing debris, storm debris, C&D waste, other mixed woody feedstocks, and asphalt shingles into salable products. Horizontal grinders offer many advantages over tub grinders, including superior particle size control, enhanced efficiency, and greater versatility. Horizontal grinders allow operators to more efficiently achieve small particle sizes required for boiler fuel, landscape mulch, animal bedding, and other finished products. Horizontal grinders generally process longer, pre-organized material typically found in land-clearing operations better. This is because of the long infeed opening which reduces the need to shorten material significantly before grinding. The featured high-capacity, low maintenance DZH 7000 Series is essential for any large-scale wood waste and landclearing grinding operation. Equipped with an internal drive feed roller which allows for; easy maintenance access, less moving parts, minimal spillage and the highest surface torque in the industry. With 1200 horsepower and production capacities in excess of 1000 yards per hour, Diamond Z's DZH 7000 Series is the horizontal choice for difficult jobs. No other horizontal grinder can imitate this machines compliment of power, unparalleled production capabilities, versatility in difficult environments, innovation, and the attention to detail that lasts in every DZH 7000 Series model. The DZH 7000TKT Series track mounted horizontal grinder has all the features and capabilities of the DZH 7000 with the added portability that comes with a track mounted machine, allowing operation just about anywhere. The DZH 7000TKT comes with complete transport system that easily and safely secures to the grinder so it is ready to be transported, avoiding expensive permitting fees. STANDARD FEATURES: Fluid coupling mill drive, reversing fan, radio remote control, tool box, engine cover, and super-screw belt lacing. Weights vary depending on options. Widths based on 600 mm tracks or Transporter width. Diamond Z reserves the right to improve our products and make changes without notice. Actual products and production rates may vary. Attention to detail that lasts. The featured high-capacity, low-maintenance DZH 6000 Series is essential for any grinding application. 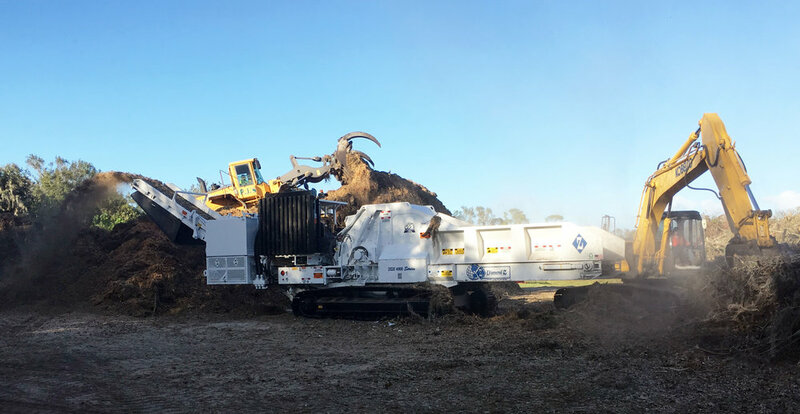 With quick screen change of 20 minutes or less, horsepower options up to 1050 hp, and industry leading production capabilities the DZH 6000 is the only Simple Choice for your Difficult Jobs. The DZH 6000TKT Series track mounted horizontal grinder has all the features and capabilities of the DZH 6000 with the added portability that comes with a track mounted machine, allowing operation just about anywhere. 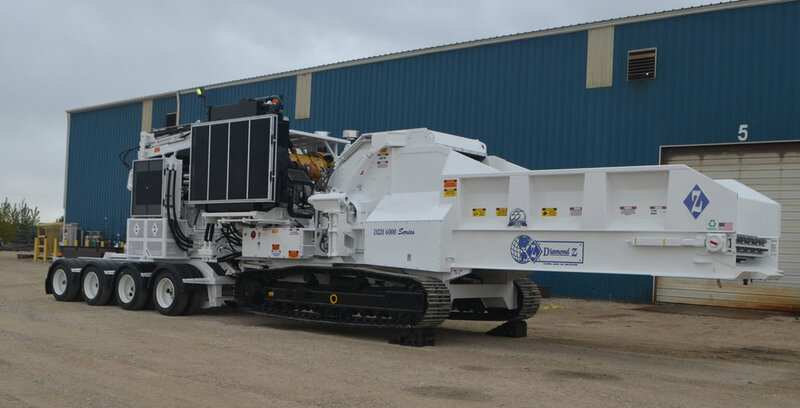 The DZH 6000TKT comes with complete transport system that easily and safely secures to the grinder so it is ready to be transported, avoiding expensive permitting fees. The DZH4000 will out grind competitor's comparably sized machines. The C18 Caterpillar engine combined with our aggressive down-cut mill delivers production rates up to 120 tons per hour. The smaller stature offers easy transportability. Friendly operation, ease of maintenance and attention to detail are throughout...hallmark traits for all Diamond Z grinders. The DZH 4000TK Series track-mounted horizontal grinder allows you to operate just about anywhere a portable grinder cannot. With up to 755 horsepower, production capacities up to 120 tons per hour, and innovative, operator-friendly design, the 4000TK is the simple horizontal tracked choice for your difficult job. The DZH 4000TKT Series track-mounted horizontal grinder has all the features and mobility of the DZH 4000TK and also includes a custom transport system with jeep providing an economical and efficient way to transport the machine. With up to 755 horsepower, production capacities up to 120 tons per hour, and innovative, operator-friendly design, the 4000TKT is the simple horizontal tracked choice for your difficult jobs. Diamond Z and Rule Steel are proud to announce the unveiling of our newest horizontal grinder. Continuing Diamond Z’s tradition of industry innovation and excellence, this machine is ready to make an impact on the industrial grinding world. This smaller, lighter, more cost efficient model is infused with all of Diamond Z’s proven performance. At 580 horsepower in a 63,000 lb. package, the DZH3000 is sure to take its place among Diamond Z’s elite horizontal machines. Fluid coupling mill drive, reversing fan, radio remote control, tool box, engine cover, and super-screw belt lacing. Weights vary depending on options. Widths based on 600 mm tracks or Transporter width. Diamond Z reserves the right to improve our products and make changes without notice. Actual products and production rates may vary.